Keep Calm and Stim On! | Mateo's Story – growing up with autism. ← Summer time, pool days, hangin out and the inevitable meltdown. 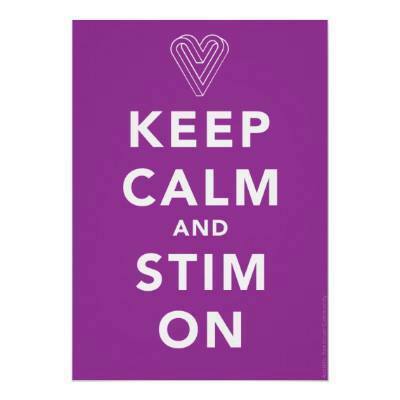 Keep Calm and Stim On! I know, every month is a different month of Awareness whether it is bringing awareness to Breast Cancer, Heart Disease or Autism. But the month of October is an important Awareness month for me. It is Sensory Processing Disorder Awareness Month. Many people probably do not really know or understand what Sensory Processing Disorder is. Per Wikipedia it defined as: Sensory processing disorder or SPD is a group of neurological disorders in which the neurological process known as multisensory integration fails to organize input coming from multiple modalities, such as proprioception, vision, auditory system, tactile, olfactory, vestibular system, interoception, or taste; in order to adequately function. Different people experience a wide range of difficulties when processing input coming from a variety of senses. However, Sensory processing disorder is characterized by significant problems to organize sensation coming from the body and the environment and manifested by difficulties in the performance in one or more of the main areas of occupation: productivity, leisure and play or activities of daily living. Many people with Autism also have SPD, not all, but many. Mateo is one of those. Sensory Processing disorder makes many things challenging for him. He can be very light sensitive, going from the classroom to the playground on a bright day can be beyond overwhelming. The rain touching his skin can cause him to stop moving and shut down. In order to process the world Mateo uses a coping mechanism called Self- Stimulatory behavior also known as Stimming. This is the most evident part of SPD for Mateo. For Mateo his current stimming is hitting his hand against his legs, flapping his arms, vocally clearing his throat. These stimming behaviors are often brought on my happiness, anxiety or over stimulation. So you will see Mateo stimming a lot. If he is engrossed in an activity like playing Angry Birds, he won’t stim as much. In class he never wants to stand out in front of his peers so he will hide it by constantly tugging his shirt or shifting in his seat. When he returns home he is able to let it all go, and holding it in all day causes him to stim repeatdly. I find it interesting though, his need to fit in. I tell him all of the time that he is perfect just the way he is, that he’s amazing, how proud we are of him. But he still seems to want to hide his Autism. I don’t want him to be ashamed of it. I think one of the best ways for me to help him besides just telling him is to get others to understand him, to understand Autism. He gets a lot of stares, not mean stares or anything, just interested ones. People wondering why is that kid moving so much, I wonder what is causing that? People may think he’s just hyper the amount he moves when we are standing in line, or walking through the grocery store or just out and about. Sometimes his SPD causes him to bump into people unknowingly. That is usually when I will try to explain things. It happened at dinner recently. We went to a place we frequent where you stand in line and order and sit down. There was no seating available, and Mateo was getting very anxious. He was so worried that we would never find a seat, and he began stimming and bumping the woman behind us. I quickly apologized, and she put her hand on my arm, and said- “PLEASE don’t worry, don’t worry at all, it’s totally fine.” She got it. I let out a sigh of relief. So I try, one person at a time to just share a little insight into the world of Autism and SPD. It’s a challenging world at times, but I don’t want Mateo to have to try to conform to feel he has to fit in. I want him to know, it’s ok to shake his hands or jump up and down to help him process the world. The world will eventually get it. They will eventually look past the vocalizations and hand flapping, they will eventually see how much he and so many people in this world with Autism have to give. One blog, one mom, one self advocate at a time- spreading awareness, hope and understanding. We can get there! This entry was posted in Daily Stuff. Bookmark the permalink.